Steve Rupert has traveled the world. But to him, there’s no place quite like Cuba. Rupert has sponsored legal trips to Cuba for years. The Tampa resident — possibly Florida’s only negotiator of malpractice suits who is not a lawyer — has been picking up some good income taking groups of from six to 20 people to the magical island. But, for him, it’s not about the money. He loves the island. 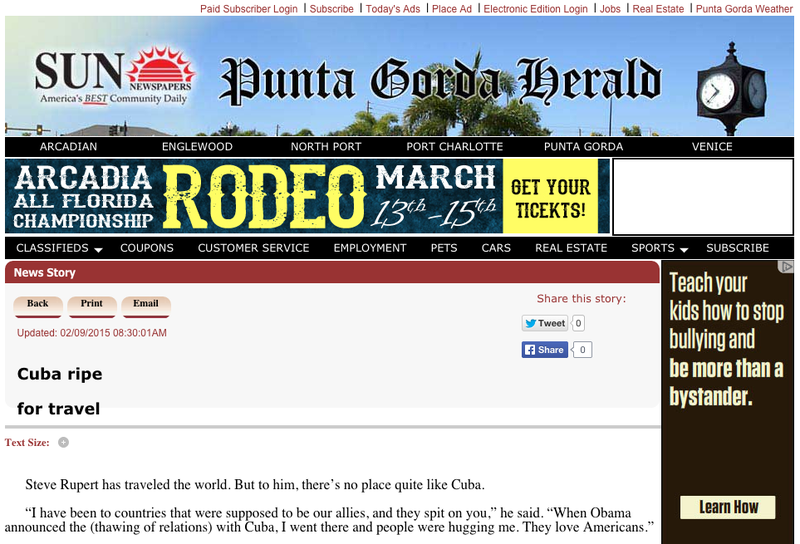 Heck, he even married a Cuban lady he met while on a sister city mission for Manatee County. Rupert says while normalization of relations with Cuba will be months or even a couple of years away — especially with the mood of the current Congress — cultural exchange trips are fairly easy to arrange. He has taken engineers, architects, students and media on seven-day trips that cost about $2,000. “The biggest cost is the airline ticket,” he said, noting Cuba has huge influence in ticket costs. He follows all the rules — mentioning that there is no day-long lounging on the beach with a beer in your hand. “This is not a tourism trip. That is still against regulations, and I do everything legal,” he said. His trips are planned to allow participants to truly experience the Cuban culture. And it all starts by staying in a private bed and breakfast with a Cuban family — not in a big hotel. He hires guides who speak English and, he said, are very friendly. Most of his clients are retirees and “bucket-listers.” But he also often takes media groups, especially for shorter trips, which can be arranged for a little less money. Rupert said there are a number of reasons to want to go to Cuba. First, it is perhaps the only country with no American footprint. “There are no chain restaurants,” he said. The streets present a feast of sights for visitors and photographers. Laundry hangs on the lines and ’50s and’60s American cars are the normal means of transportation. “The only American thing you will see is maybe a ’57 Chevy going down the road,” he said. Second, there is virtually no crime. And, if you like to dance, this is the place. Salsa and Merengue are two popular forms of music but something new — called reggaeton, is catching on. Rupert’s trip package includes the visa, air and board. All you need is a passport, a love for adventure or a thirst to see Cuba — before it all changes. Check it out at cubatraveladventure.com or call him at 813-263-6300.